Uno is an agent for the United Nations. Technically he is Jim Blake, the U.N.'s "trouble-shooter". As stated in the first recorded adventure: "When the United States beat the Axis into surrender and emerged victorious from the most colossal war in history, they formed the United Nations Organization (U.N.O.) to help keep the world peace. But knowing there would be problems whose solutions would require unusual tactics and handling, the Security Council of the U.N.O. has secretly hired famed trouble-shooter Jim Blake! Known only to a few members of the Security Council, Blake operates under the name of 'Uno' - the United Nations Trouble-shooter!" So Blake assumes that codename and it is by that he is best known though he does not especially try to hid behind it. After that first adventure, it appears as though he has been busy because people seem to know him, as Uno, wherever he travels. Usually he is welcome by the powers that be because of his ability to help them out of trouble but sometimes there is hesitation, explained by him when he stated once "where I show my face it usually means trouble". Uno is a hands-on kind of operative, though fist-on might be more accurate. He has no qualms about jumping into a fray and letting the bad guy have it with a left or a right. He, unfortunately for his skull, is on the receiving end of things as well. Ace Magazine was a company created, according to Wikipedia, by Aaron and Rose Wyn using the A. A. Wyn's Magazine Publishers company as the foundation. 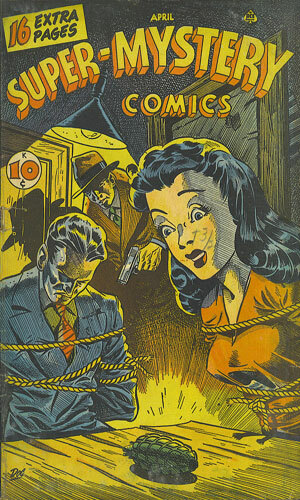 It got into comics in 1940 and stuck around until 1956 where it was used as one of the shiny examples of excessive violence and other unsavory influences on the boys of the country. 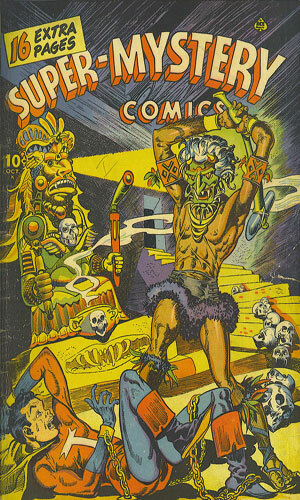 It had in its life a pretty impressive lineup of comic book titles running the gamut from superheroes to romance, westerns to futuristic. 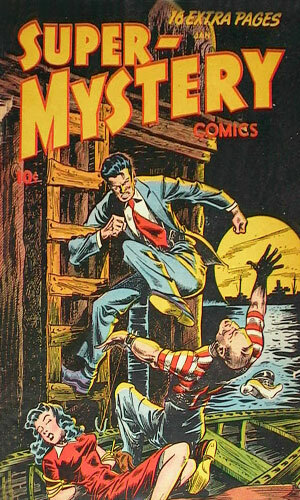 The imprint Super-Mystery Comics was one its most successful lines. 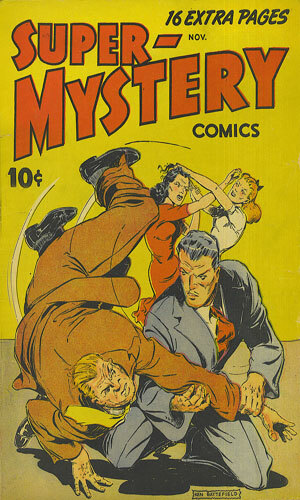 It was in that magazine that the popular (for a while) Magno and Davey whooped bad guys on a regular basis. 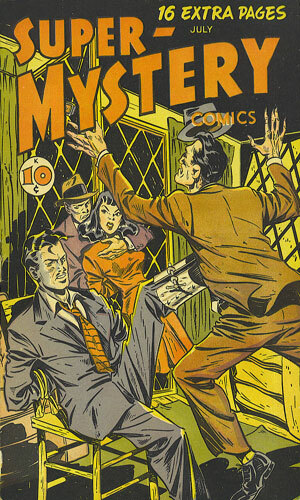 Each issue had two or three other storylines, one of the best of which was, IMHO, Mr. Risk. 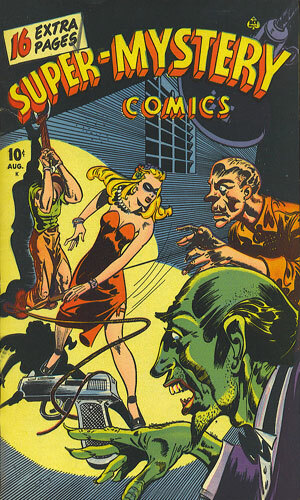 The comic came out bi-monthly giving the readers 6 issues a year. Uno came along in the second half of the magazine's life, there for all of year 6 and half of year 7 before vanishing. Note: the titles in quotes are my own invention. 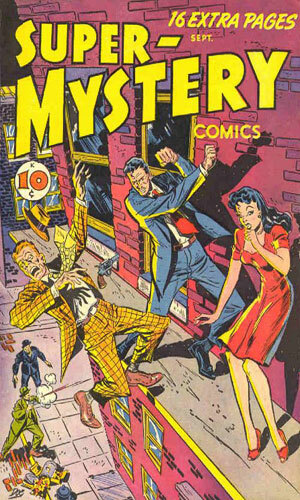 From Super-Mystery Comics v6-1 - 11 pages - In Vienna, former Nazi agents kidnap a British diplomat who they think has plans for the atomic bomb on him. Uno flies to Austria to find and free the man. From Super-Mystery Comics v6-2 - 12 pages - A world-wide organization intending to reestablish fascism around the globe is up to no good in South America. A pocket watch handed to a foreign correspondent plays an important role and it is enough to send Uno to Rio. From there things get quite confusing. From Super-Mystery Comics v6-3 - 12 pages - The sacred slipper of Mohammed, "greatest treasure of the East" was being moved from a vault in Istanbul to its rightful shrine when it is stolen. Fearing a religious war, Uno is sent to Baghdad to find it. From Super-Mystery Comics v6-4 - 10 pages - A Baron representing numerous smaller nations is giving a speech to advocate on their behalf but the head of an opposing force is determined to undermine his work. Uno is ordered to safeguard him. From Super-Mystery Comics v6-5 - 9 pages - The late Prime Minister of the kingdom of Balkania has written an important memoir which has now gone missing. Jim Blake, Uno, as been brought in to find it before it is destroyed. 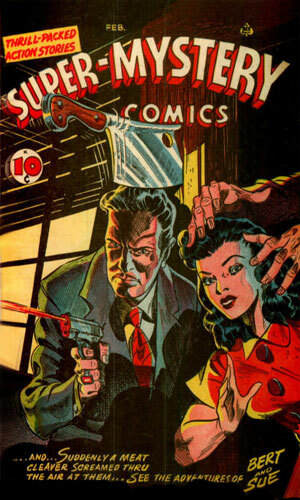 From Super-Mystery Comics v6-6 - 10 pages - To foment war between two Balkan nations, agents from another nation have killed one ambassador and sent a look-alike to a UN meeting to kill the other. Uno must stop a war from resulting. 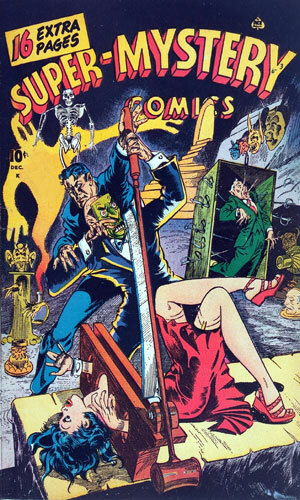 From Super-Mystery Comics v7-1 - 11 pages - A half-billion dollars of money and treasure had been hidden in a Balkan castle in case the Nazis lost power. Now that they have, a group of them want to get it to mount a return. It is Uno's job to get to it first. From Super-Mystery Comics v7-2 - 11 pages - The US is giving the UN a nuclear bomb for testing and for clearing land in Brazil's Matto Grosso region. A group of Nazis are planning on stealing it to get power back. From Super-Mystery Comics v7-3 - 12 pages - When the sheik of an oil-rich region of the Middle East refuses to sign with former Nazis, they kidnap him knowing his abduction would bring about riots and hopefully destroy the oil derricks. Uno is sent to get the sheik back. These were worth the few minutes it took to read each one and they provided entertainment but I can see why the character did not stick around. Fair but not compelling.